Light and space-agey: that was my first impression when trying on Arc'teryx's new Acrux AR (All Round) mountaineering boots for the first time. Designed to be the "lowest volume weatherproof double boot ever made," Arct'eryx says, the boots certainly looked that way. But my wide feet and those low-profile boots just didn't go together, at least not at first. Fit aside, my feet never got wet or cold in them, whether I was climbing in wet conditions in Vermont or in freezing temperatures in Hyalite Canyon, Montana. Additionally, these boots didn't get too warm when I was post holing in heavy snow on the Cosmiques Arete (5.6 AI2 M4, 1,000') on France's Aiguille du Midi. And the boots were certainly light, which made kicking steps feel less tiring than my other boots. The first day out, I wore the boots on a long ice flow just up the road from Alpinist's office in Jeffersonville, Vermont. Almost immediately on the hike in, I noticed soreness in a few spots on the outside of my left foot, which grew worse throughout the day. My right foot hurt too, but not as much. Three-quarters of the way up the 650-foot route, I was already adapting the way I kicked the ice to protect the several hot spots on my feet. 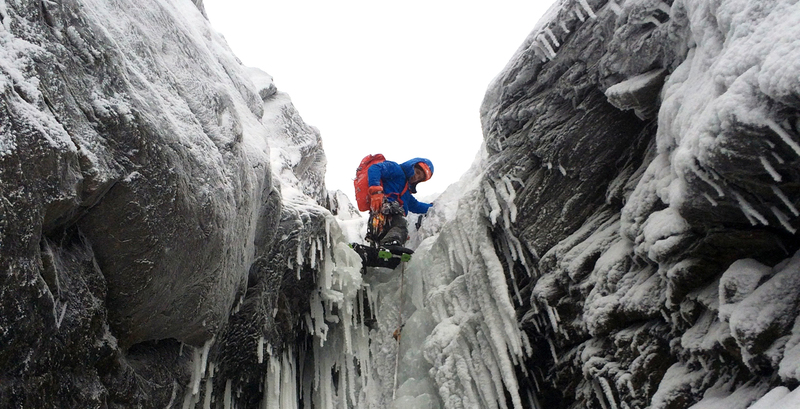 After we topped out, we thrashed our way through thick trees, crawled through an ice chimney and rappelled into a steep gully before we down climbed hundreds of feet over soft snow and crud. Melting snow got in everywhere, except my footwear. By day's end, I expected my feet to hurt—but not nearly as much as they did. It took a few days for the pain to subside. At first I thought the boots just didn't fit, but over time I learned that was not the case (they just took longer to break in than other boots). Gradually, over a combined several weeks of climbing, the boots broke in. When at the end of the climbing season, I climbed the classic alpine Cosmiques Arete—which required a mix of ice, rock, steep snow and even stepping in a drilled pocket—I focused on the terrain and incredible views instead of on my feet. To achieve low weight and high performance, Arc'teryx designed the boots with a zip up, three-layer GORE-TEX membrane, a perforated 3D PE (Polyethylene) foam inner layer, carbon fiber insole with expanded PU (polyurethane) foam midsole, and rugged Vibram soles. The boots also have a low-snag draw closure top that's cuffed and fastened shut with a snap. "The boot is designed for 4000 to 5000-meter peaks," Greg Grenzke, apparel designer at Arc'teryx, told me. "Our goal was [to build] a boot which was in between a SCARPA Phantom 6000 (995 grams) and a La Sportiva Batura 2.0 GTX (968 grams). Or better, a boot with the volume and the climbing performances and the weight of a Batura 2.0 but with higher insulation and the benefit of a double boot construction." The Acrux AR boots are a bit lighter, at 952 grams. They're precise, lighter than other boots in their class, and have a stiff sole, which made me more confident on steep slopes. Getting the boots on remained a struggle. I wasn't able to get my foot into the outer boot without first putting on the inner bootie. The flexible inner bootie is designed to conform to your feet and constructed with GORE-TEX. The liners have both front and rear pull loops, which came in handy when I tugged firmly on them to get the boots on. Once on, I'd lace the boots up to the base of the ankle and then cinch the boots down using high top positioned Velcro. This combination of lacing and Velcro allowed for a comfortable walking stride, where with other boots I'd keep my laces loose on the approach and tighten them at the base for a performance fit. The insulating external gaiter and draw-top closure kept snow from getting in the boots during glissades, but the gaiters fit snugly even without the closure cinched down. I'm looking forward to getting in a big winter with them in the Colorado Rockies, especially now that they're properly broken in.